Cochief / Cochief provides total solution of light source solution to create more innovative products with customers. Cochief is a manufacturer for a diversity of lightning design products and is working together with companies worldwide to assist and improve their products since 1998. With a  professional design team、 their own produce line and strictly quality control department, Cochief offer backlight solution to meet customer needs and  fullfill rapid prototyping. We offer high quality technology to support and enhance your products. 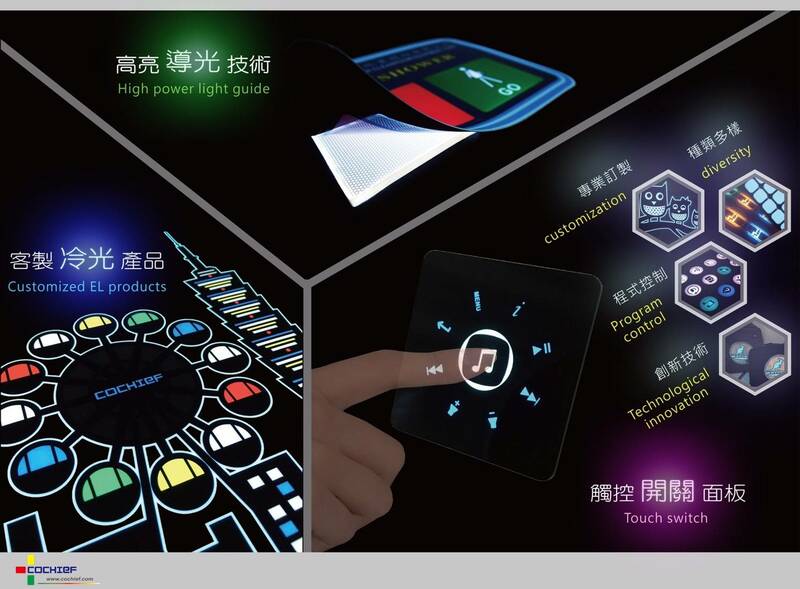 With more than 19 years of engineering experience we’re specialized in developing backlighting electronic components using Electroluminescent lamps (EL)、Light guide plate (LGP)、 Light guide films (LGF) 、Flexible Touch Sensor Module、and LED applications. We proudly announce to provide our customers our new innovative product – The Flexible Touch Sensor. No matter whether AC, DC, or battery - we can provide you our inverters together with our EL panels. See how you can use electroluminescent panels - the options are limitless. Use our Light Guide Film to backlight your products. Copyright © 2019 Cochief Industrial Co., Ltd. All Rights Reserved.